Halloween is almost here! Parents and kids will soon walk door to door to fill their goody bags with candy. If you haven’t already started making your Jack O’Lantern, now is the time for you to get started. I have got a few hacks that will keep you and the kid’s safe in the process of creating your Lantern. Can’t keep the pumpkin still? Cut the bottom of your pumpkin out. By cutting the pumpkin at the bottom, it will keep your odd shaped pumpkin from moving while you’re trying to carve, which means you’re less likely to get cut or lose a finger in the process. You will also be very thankful when it’s time to put the candle inside. Simply just place the pumpkin over the top for the candle instead of trying to stick your hand into light the Lantern. I don’t want my kids using the carving tools. The thought of your children attempting to carve a pumpkin probably has your stomach turning right now. Don’t worry! Bring the camera out and take fun photos to glue on your pumpkin. The pumpkin will make for a great picture frame for the holiday season. The kids can also bring out the paint and markers for this as well. It will be tons of fun, and you won’t have to worry about anyone getting hurt. How do I make my lantern last longer? Put a teaspoon of bleach in a spray bottle with water. Spraying the inside of the pumpkin and where you carved will kill bacteria that causes the pumpkin to rot. You can also soak the pumpkin for 4 – 6 hours in bleach water. Use one teaspoon for every gallon of water you use. 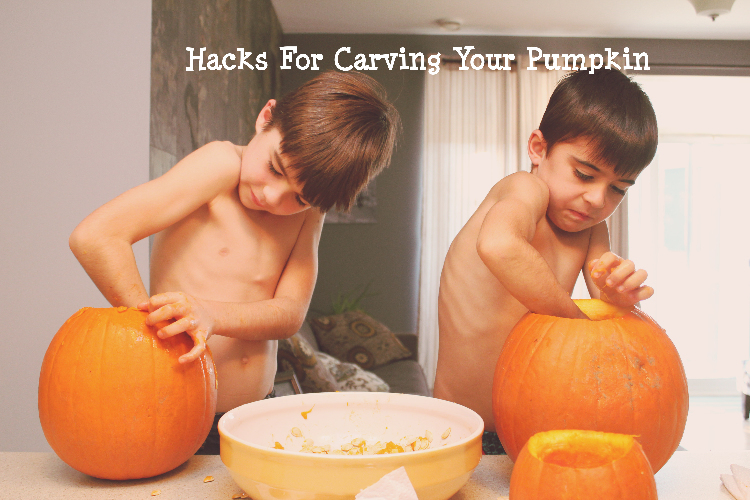 Make sure that you have carved the pumpkin before soaking it. You can also use petroleum jelly on the areas that you’ve carved; it will keep mold and other bacteria from growing on or in the pumpkin. I don’t know how I feel about a candle being inside the pumpkin. Putting a candle on the inside of your Lantern is a fire hazard, especially if you are using bleach to disinfect your lantern. We don’t want the kids to play with fire at all. Use a glow stick instead. It will be a great way for you to keep the Lanterns glowing while you sleep through the night worry free. If you have Christmas lights, place them on the inside of the lantern. You’re all set! Be sure to pick up your pumpkins from your local grocery store instead of the pumpkin patch. The prices at the grocery store will be a lot lower, and they often have a “2 for 1” deal around this time. Like this post, if you’re going to be carving your Lanterns this Halloween! Be sure to share with us how yours turns out! Happy Halloween!